This event is PWYC with a suggested donation of $5. 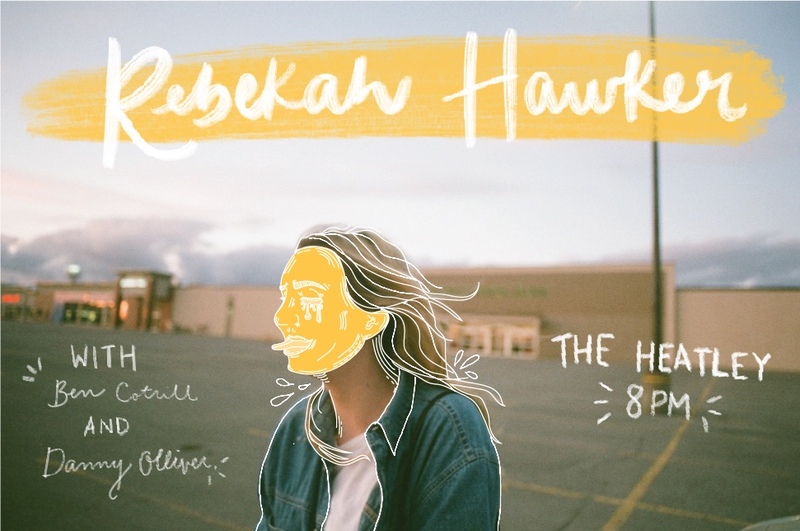 For the past five years, Rebekah Hawker has been giving Toronto audiences the acknowledgement they never knew they needed; singing their pain into a crowded room. Her accolades in songwriting and vocals include winning the Summerfolk Youth Discoveries and Seneca’s Got Talent competitions in 2014, placing second in the Barrie Folk Society’s Youth Songwriters Showcase in the same year, and third place in 2013. She completed Seneca College’s Independent Music Production program in 2014. Rebekah Hawker has collected professional accomplishments over the years like rainwater in a wineglass, a simple testament to her capacity to transform the grievances of her peers, her audience, and herself, into something that satisfies our thirst for honest representations of life beyond artifice. By his mid-teens, Vancouver artist Ben Cottrill had already spent years busking in public squares and quietly becoming a skilled songwriter in his own right. Now with a feature on CTV’s “The Launch” music series and over 80,000 streams later, one can only guess where Ben Cottrill will find himself next. Equipped with a guitar and a strong sense of self, Regina, Saskatchewan’s Danny Olliver has made a global name for himself. Olliver learned guitar on an abandoned three string Yamaha he saved from being trashed. A quick study, he added three more strings and began writing his own material. Taking inspiration from guitarists like Don Ross and Antoine Dufour, Danny focused on fingerstyle pieces. His musings as a fingerstyle guitarist gave him an exceptional edge as a musician when he began writing his own songs and singing in 2008. After his first release (Bad Omen Walking) in 2014, Danny spent a year touring around Canada. With fire in his boots and a love for the road, it took him only a year to record and release his self-titled sophomore album — which he toured all over Canada and Europe playing more than 500 shows since his first release. He has toured with bands like The Dead South, Colter Wall, and Michael Bernard Fitzgerald. Olliver’s troubadour spirit is now truly awake as he prepares for the release of his third full length album – “For All My Former Lovers“. His new album is a collection of songs dedicated to heartbreak, love, loss, and youth. Stocked with equal amounts of capricious heartbreak and melodic whimsy, Danny Olliver and award winning producer Russel Broom have no doubt added a triumph to Olliver’s musical catalogue.